The Blessing of the Bells! The bells arrived just in time for Easter Day in 2006. 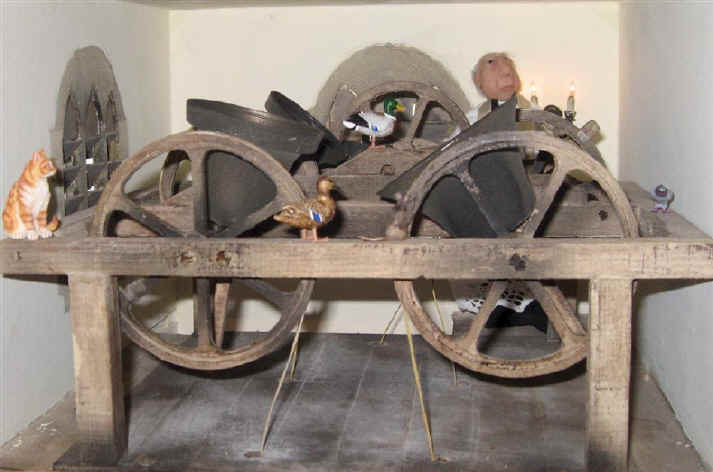 See how the blessing of the bells went below and how Easter was celebrated that year too! The vicar had to climb up the stairs and into the bell tower before the morning service in order to bless the bells that have been repaired and restored for regular use. 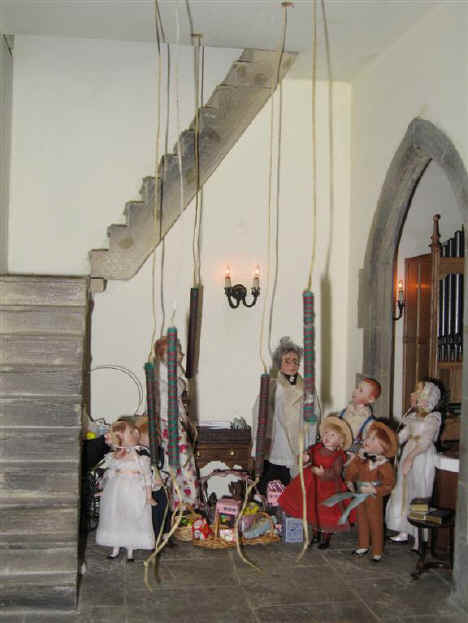 Whilst the vicar was stood upstairs in the belfry blessing all the bells some of the children and congregation including Rev Ken were watching from below! They were not allowed to climb up to the belfry because it was too dangerous. 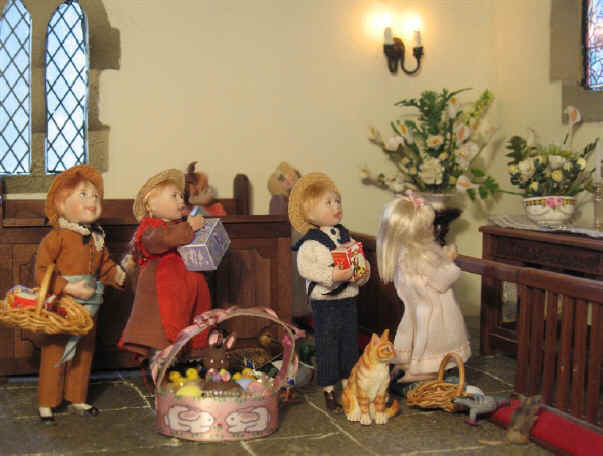 The chocolate Easter eggs and bunnies have been brought to church and will be hidden for the children to find in the afternoon. They can't wait! Adele is showing off here as you can see! She really had wanted to light the paschal candle herself but the vicar insisted that it was Ben's turn this Easter Sunday morning. However Adele wasn't going to let Ben try on his own. 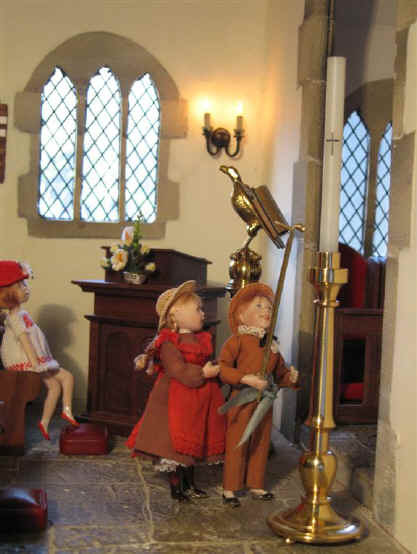 You can see here how she is trying to help him light the candle! Alice is the first to spot an amazing event. A beautiful butterfly has flown in to the church and is heading for the pulpit. 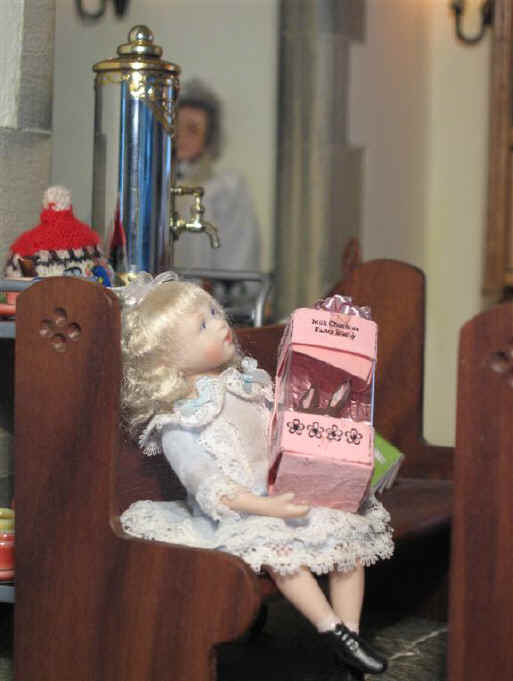 She alerts the vicar and he is excited too. 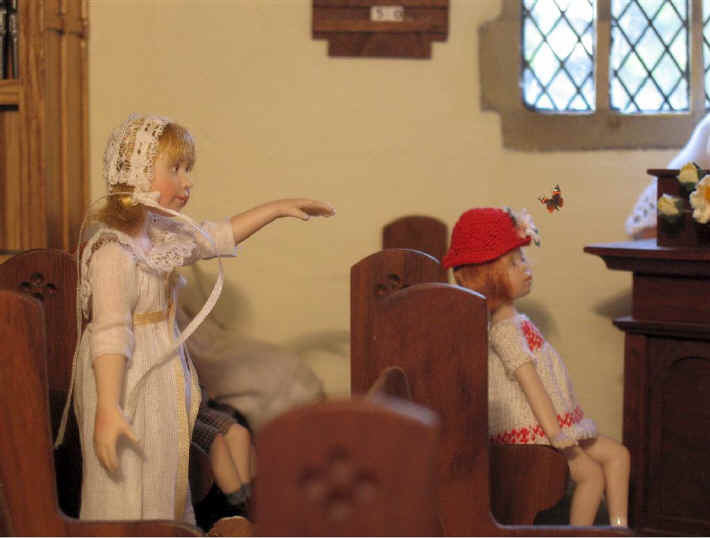 The vicar quickly realises that the butterfly has given him an extra illustration for his sermon. A butterfly, he tells the children and congregation, represents new life in the same way as Jesus did by rising from the dead. The butterfly began life as an ordinary looking caterpillar. However, after becoming a chrysalis, it is completely reborn into a totally new and beautiful creature, the butterfly. Here you can see a beautiful close up of the butterfly that flew into the church and landed on the flower arrangement on the pulpit. 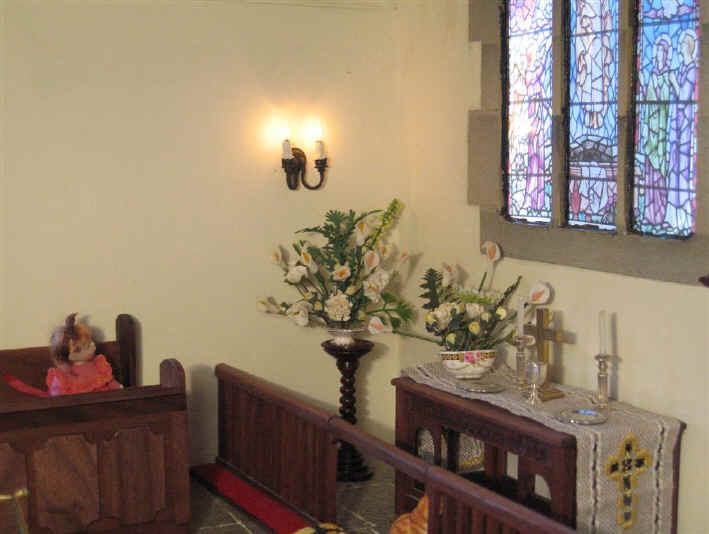 Amelia has decided to stop reading her book and spend a little time after the Easter morning service admiring the flowers on the altar and in the sanctuary! Easter Sunday afternoon couldn't come quick enough for the children. As you can see Emily has found THE biggest chocolate Easter bunny she had ever seen in her whole life! All the children have found at least one Easter egg to take home! Priscilla Jane NEVER forgets to say a prayer to thank God. Today she is thanking God for allowing His son, Jesus Christ, die on the cross and rise again so that she too, can have new life. The paschal candle has been made especially for us by John Cheal. (visit his website and see more!) 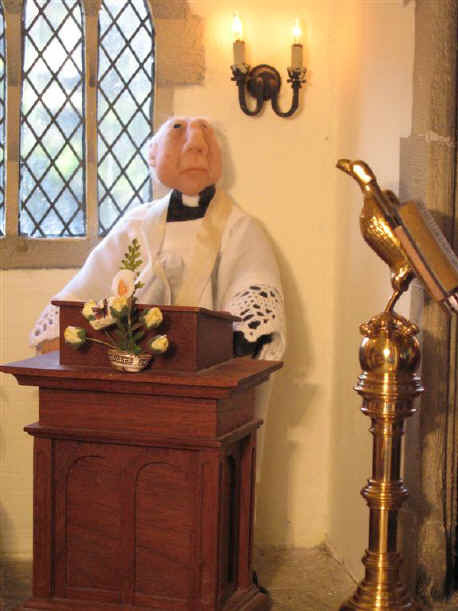 As with the eagle lectern it is modelled on the full size article in Holy Trinity Church, Stratford upon Avon. The candle is made out of brass and John tells us the wick is real! It is black so that it looks as if it has already been lit and snuffed out. The year has been left out so that we can use this year after year.